If you like the scene on Koh Phangan, then why not visit Pai.. So, Koh Phangan is a pretty amazing island. Not only if you want to dance the night away and drink buckets at the full moon party, no, Koh Phangan is also the place to be if you are more into the relaxed hippy vibe. Zen beach is a good example of where you’ll find people making music, meditating and doing yoga. Another place in Thailand where you can find these types of vibes is Pai. Let me explain why. Pai is a little mountain village in the north of Thailand, close to the border of Myanmar and a three-hour bus ride from Chiang Mai. The difference between Pai and the rest of north Thailand is that it has a mixture of the Thai and western culture. You will see a lot of locals with tattoos, dreads and outfits that don’t cover much skin. Pai is full of creative people, both locals and digital nomads. 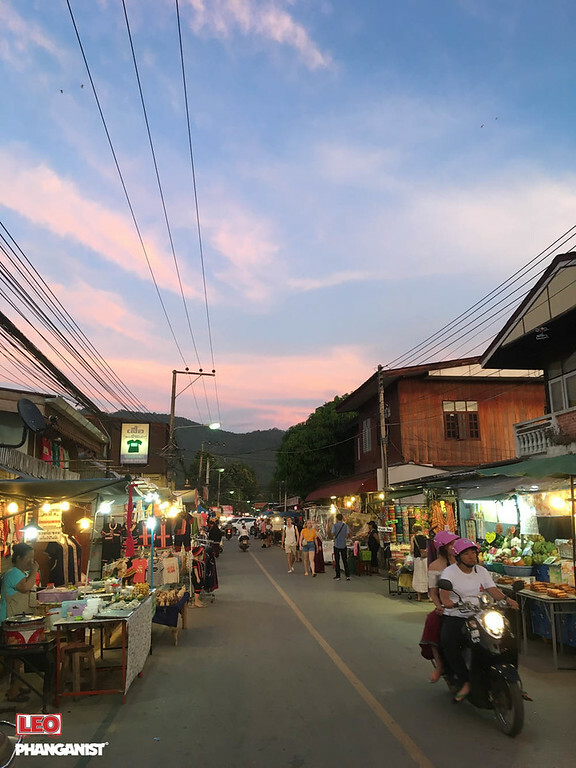 I have met quite a few folks that thought that they would be in Pai for just a few days but ended up staying for months or even years. Just like Koh Phangan, it offers two different backpacker experiences: the one that’s all about ‘going crazy and party’ and the one that’s centred around the shamanistic relaxed hippy vibe. The first one is easy to find, can’t miss it really. Just stroll around the walking street, where there are all types of good (and cheap) street food, nice little shops and backpackers everywhere. In the evening the walking street gradually changes from a place to eat into a party scene. In contrast to Chiang Mai, here it’s okay to drink in the streets. Around nine o’clock the bars start turning their music up. You can just walk in and out of every bar, so it’s easy to find a place to your likings. You’ll notice that everyone is just one big happy family on the dance floor. Because Pai is pretty small, you will run into the same people all the time. Then, parallel to this, you’ve got the shamanic hippy scene I was writing about before. This scene is not as easy to find as the party one because it is not that centred, but it’s definitely there. For example, Rachel and Michael are a couple that lives in Pai. Every Wednesday night they welcome travellers to their beautiful home for a cacao drinking ceremony. You will meet people from all over the world, share cacao drinking with them and do breathwork exercises to activate the nervous system and flush fresh life force through your system. This is an example of a way to meet people in Pai that are living the more natural, holistic kind of life. When you connect with them, you will automatically find more places and spaces for similar activities, like ecstatic dancing. Other ways to enter this community is to participate in yoga or meditation classes or hang out at vegan bars and restaurants, like Earth Tone or Good Life Dacha. If you’re starting to miss the beautiful beaches that Koh Phangan has to offer, you can easily travel south. Just book a minivan (they leave every hour) to Chiang Mai. From Chiang Mai, you have two options. If you’re not in a hurry then I advise travelling the traditional and environmental-friendly way: by train or bus. You will first go to Bangkok and from there to Koh Phangan. But, if you don’t want to spoil your time on the road, then you can also fly to Koh Samui or Surat Thani from Chiang Mai. Keep in mind that this way you will also always have a layover at Bangkok. Koh Phangan is really worth it, ‘though.